Edited 1 time(s). Last edit at 07/03/2014 04:38PM by Ted Hall, ShopBot. For those of you who may be interested, attached here are images of the development hardware we are using while working on the new FabMo/G2 Platform. Handibot Development Components. Right to left, is the Handibot CNC Interface Board which connects the Control Card to Stepper Drivers and provides isolation for Inputs and outputs. Then there is the Arduino Due and "ShopBot Shield". When these two are sandwiched together the create the electronic version of the new Control Card and plug into the CNC Board. 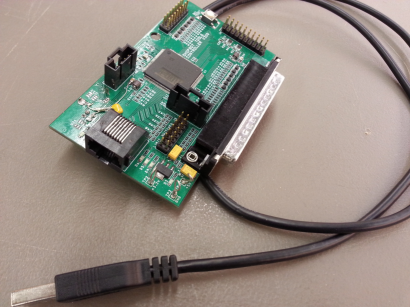 For convenience we attach a USB hub and plug a Wifi module into it. And the Beagle Bone SBC attaches to the hub. Assembled Development Hardware. Here's what it looks like all plugged together. If you did not want to move the Handibot, you could just plug the Beagle Bone into a Due and run the same system we are working on. Handibot with Development Electronics. And, this is our hot-rod Handibot with a few modifications to the hood to allow plugging in the Due and ShopBot Shield. Note the Beagle Bone hanging in the compartment at the back left of the tool (the SBC will fit in the main compartment with the new Control Card). We've been doing testing and are generally pleased with the speed and smoothness of the G2 motion. Edited 4 time(s). Last edit at 07/09/2014 02:15PM by Ted Hall, ShopBot. Work is moving along on the new system for running Handibots and doing Handibot "Apps". We hope to make several release announcements in December ... but wanted to let you know we are close on several major projects. Hardware. We have been running the first version of the new Control Cards for about 6 weeks now. In the post above I described our development board as an Arduino DUE with a ShopBot shield. The new Control Card is the DUE rendered in a ShopBot form-factor version. We've got a few additional changes/fixes needed to the board (you'll see a bit of soldering in the one pictured below), but we expect to have a batch of beta versions by next month to begin full field testing. FabMo App SDK -- a high-level developer resource of templates and libraries; to be used by Handibot App and digital fabrication project developers. The SDK is based on support and functionality made available through the FabMo Dashboard. We're hoping to have a first draft of the SDK and several example App templates available in December. FabMo Dashboard -- makes running Handibot Apps (both "Utility Apps" on the tool and "Project Apps" from the cloud) straightforward from a variety of devices (wirelessly or via USB or ethernet). The FabMo Dashboard manages Apps and Jobs and handles links with tools. While a lot of work is already viewable on GitHub, we're hoping for a definitive "beta release" version in December for those who want to start testing their Apps. FabMo Engine -- is the primary functionality of FabMo and runs on the SBC on your tool. The Engine manages tool-path files and jobs (in g-code or OpenSBP-code) and configuration files; handles flow and interactions with G2; serves up the API on which the Dashboard is based. We hope it too will be ready for an intial release in December. FabMo G2 Core -- The "Core" is the firmware that runs on the Control Card (or other devices such as the DUE or the V9 verison of TinyG2 and is oriented to ARM processors). It provides a powerful and extensive motion system for digital fab and robotics. While working on FabMo, we are also continuously interacting with the Synthetos team to help push their project along and to make sure we have gotten the integration right. G2 is available from the Synthetos GitHub site and while still under active development it is already running well on a number of systems. There is still some work needed but G2 is functional and ready to load onto our new Control Cards as they become available. Tool Development. Besides this progress on the control system hardware and software, we have been working on the tool and its accessories. In December we will announce availability of a new physical Version 1.10 of the Handibot. This version will be updated to incorporate a number of things we've learned and that users have contributed on the basis of the Developer Edition and Kickstarter tools. These changes include: a new front panel that provides better visisbility and improved access to the router for bit changes (we call it the V-Neck and it comes with a removable, clear, front shield); backing plates for the Y-axis bearing blocks to make adjustment of alignment easier and more permanent; and improved proximity switches. All these enhancements (except the prox switches) will be available as cutting files for DIY upgrade, or available for purchase as an upgrade kit from us. At the same time, we will release (as DIY files and packages for purchase): a full hood cover for top of the Handibot that captures more noise and dust; a clip-on laser-alignment light; and a rotary indexer (4th axis). I'm also hoping the "Crawler" for automatic indexing the Handibot down a board is coming soon. Look for full announcements about these steps in Handibot progress in the coming month. Then, early next year we will begin shipping the new Control System with Handibots (probably introducing some additional physical changes at that time too). We will also have Control System upgrades available for older Handibots.